WHAT EXACTLY ARE “FINE MOTOR SKILLS” AND WHY ARE THEY IMPORTANT? Fine motor skills are the coordination of small muscles in the fingers, hands, and forearms. Children need to develop strong fine motor muscles in order to complete important tasks such as holding scissors to cut, gripping a pencil to write, or buttoning/zipping their clothes when getting dressed. 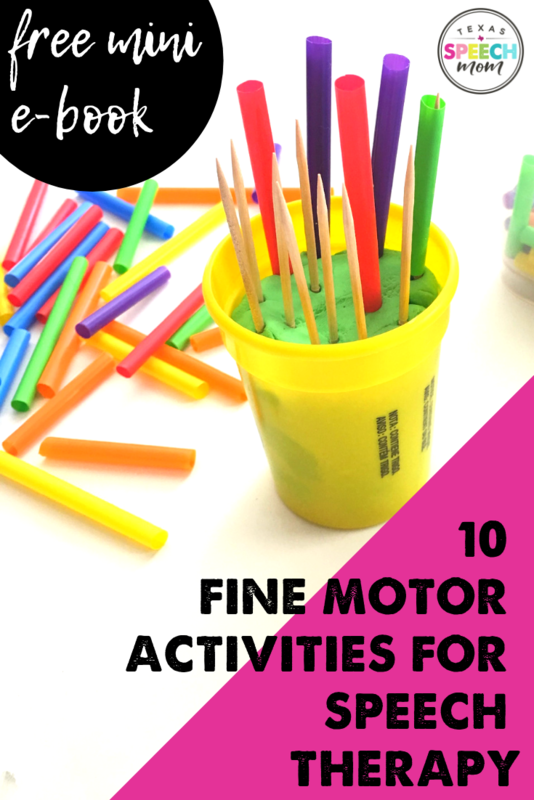 HOW CAN I INCORPORATE FINE MOTOR ACTIVITIES INTO MY SPEECH THERAPY SESSIONS? Incorporating fine motor activities into your speech therapy sessions can be a wonderful way to increase participation and interest in what you are working on. The best part is that this can be done inexpensively and with minimal prep time. Popsicle sticks and mini hair elastics: Write your target words on the cards. This can be articulation words, sight words, math problems, etc. Turn a card over and say your word 5 times. Next, roll the dice and put that amount of mini hair elastics on the jumbo craft sticks! Stacking Items: This is always a favorite of mine because the kids are always engaged whenever you switch out the manipulatives. Suggested objects to stack include plastic eggs (opened), mini erasers, blocks, snap cubes, coins, etc. This is a great way to elicit a ton of trials during articulation drills without needing many supplies. Alternative Goals- Degrees of comparison: biggest tower, smallest tower, this tower is smaller. ; Following Directions:Stack two pink cubes AFTER you stack three blue cubes. ; Pronouns: She has a tower with four erasers. He has a tower with three erasers. Her tower is taller. Paper Clips and Clothespins: Using paper clips and clothespins can be an incredibly inexpensive way to incorporate fine motor skills during speech therapy drills. The child can attach a paperclip or clothespin to an individual stimulus card, around the edges of a paper, create a paperclip chain, or manipulate the paperclips to form the targeted letter. Click Here for the link to the activity in the picture above. Kinetic Sand and mini animals: Start with open conversation about the kinetic sand. Talk about only using your fingers and how the sand feels when you squish it. Goals to address: VC Words: in, off, out, on; Prepositional Phrases: in the box, in the sand, on top of the, next to the __, between the ___, under the ___. ; Plurals: I would put 1 animal in the sand and they would add the match “one pig, two pigs”. ; Sorting: animals that fly, animals that walk on four legs, animals that have a tail. Puzzles: Grab a cheap puzzle (dollar stores, Walmart, etc) and number each piece. Put a puzzle piece on each stimulus card and let the child find the correct spot! You can use this activity with numbers, alphabet, shapes, etc. This is a great way to introduce the little ones to the skills required for “big kid” puzzles. Legos: There are SO many goals that you can address with this inexpensive manipulative. Pronouns- “Give a block to her; This is his block”; Prepositions- “The princess is on top of the pink block. The doctor is between the two blocks.”; Following Directions- “Put the princess on the blue block AFTER you put the doctor on the yellow block.”; Reinforcement during drills- student gets a block after each trial. Pom Poms and Tweezers: Using plastic tweezers to pick up pom poms is a great way to work on fine motor skills and hand eye coordination. Additional goals include: Pronouns- “She has three pom poms. He picked up four pom poms.”; Prepositions/Phrase level: “The pom pom is ON the ___.”; Following Directions: “Pick up a blue pom pom after you pick up a yellow one.”; Reinforcement during drills- student gets a chance to place a pom pom in an ice cube tray after each speech trial. Scissor Skills: This is a pretty straightforward activity that the kids love. Grab some kid friendly scissors and scraps of construction paper. After each correct speech therapy trial (varies depending on the child’s goal), allow the child to cut a piece of the paper off. Once all of your speech trials are done, the child can glue all of the cut up pieces to a paper plate. Hole Puncher: Using a hole puncher is another inexpensive way to incorporate fine motor skills during speech therapy drills. The child can use the hold puncher along the edges of a notecard, bulletin board shapes/cut outs, or on photocopies of stimulus cards. I DON’T HAVE TIME TO MAKE ANYTHING. ARE THERE ANY “FINE MOTOR” SPEECH THERAPY ACTIVITIES THAT I CAN BUY? Oh, I’m so happy you asked! (insert wink) CLICK HERE to check out all of my downloadable activities that I use during my speech therapy sessions. ARE THERE ANY MATERIALS OR TOYS THAT YOU RECOMMEND? Yes! I have created an amazon store front full of my favorite fine motor games and activities! Click Here or the image below to see! I LOVE FREEBIES. DO YOU HAVE ANY OF THOSE? As a matter of fact, I do! I have created a FREE DOWNLOAD with the information included in this email AND several printable activities ready for you to download immediately! Click the image below to subscribe and gain free access to the Fine Motor e-book and many other freebies! Thank you for sticking with me through this long blog post! As you can see, I am passionate about making my speech therapy sessions functional for little ones. Targeting fine motor skills is the perfect way to do that! Come back soon as I will have many more ideas on how to make those tough speech therapy sessions FUN and FUNCTIONAL!